You'll explore the less-touristy side of things at Red Canyon and Princess Beach. Next up on the itinerary: push the limits with an extreme tour, test your team's savvy at popular escape rooms, take in the waterfront activity at Eilat Marina, and see the vivid underwater world at Dolphin Reef. To see photos, reviews, ratings, and more tourist information, go to the Eilat trip builder app . Tel Aviv to Eilat is an approximately 1-hour flight. You can also drive; or do a combination of train and bus. Traveling from Tel Aviv in October, expect nights in Eilat to be about the same, around 25°C, while days are a bit warmer, around 39°C. Cap off your sightseeing on the 18th (Thu) early enough to go by car to Mitspe Ramon. 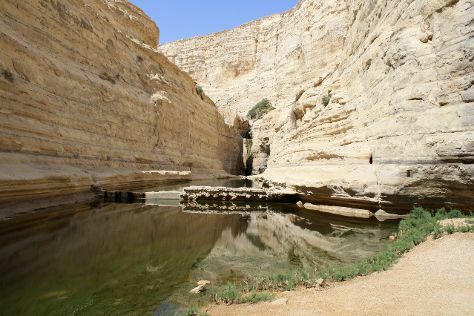 Start off your visit on the 19th (Fri): explore the stunning scenery at Avdat National Park, then explore the ancient world of Nabatean Avdat Acropolis, and then have fun and explore at The Alpaca Farm. To see maps, photos, reviews, and tourist information, read our Mitspe Ramon visit planning site . Getting from Eilat to Mitspe Ramon by car takes about 2.5 hours. Other options: take a bus. While traveling from Eilat, expect a bit cooler days and about the same nights in Mitspe Ramon, ranging from highs of 32°C to lows of 22°C. Wrap up your sightseeing on the 19th (Fri) early enough to take a bus to Jerusalem. 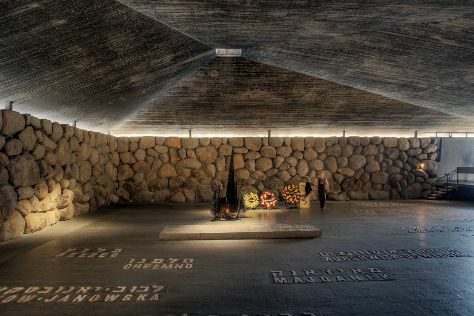 Kick off your visit on the 20th (Sat): have fun and explore at Tower of David Museum, let your taste buds guide you at a local gastronomic tour, and then get engrossed in the history at Yad Vashem - The World Holocaust Remembrance Center. On the 21st (Sun), you'll have a packed day of sightseeing: see the interesting displays at Israel Museum, take in the spiritual surroundings of Church of the Holy Sepulchre, take a stroll through Old City of Jerusalem, then explore the ancient world of Western Wall, and finally steep yourself in history at Mt of Olives. To find maps, reviews, more things to do, and other tourist information, refer to the Jerusalem trip planner . Traveling by bus from Mitspe Ramon to Jerusalem takes 3.5 hours. In October, daytime highs in Jerusalem are 34°C, while nighttime lows are 21°C. Finish up your sightseeing early on the 21st (Sun) so you can catcht the bus to Haifa. Start off your visit on the 22nd (Mon): take in the spiritual surroundings of International Center Mary of Nazareth, steep yourself in history at Beit Shearim, take in nature's colorful creations at Baha'i Gardens and Golden Dome, then don't miss a visit to Louis Promenade, and finally make a trip to Yefe Nof Street. On your second day here, enjoy the sand and surf at Dado Beach, then explore the historical opulence of Crusader Fortress, then take in the spiritual surroundings of Bahai Gardens and Shrine, and finally engage your brain at Mada Tech - The Israel National Museum Of Science. Use Inspirock's suggestions to plan your Haifa trip and find the best activities and attractions for your vacation. You can take a bus from Jerusalem to Haifa in 2 hours. Alternatively, you can do a combination of bus and train. In October, plan for daily highs up to 32°C, and evening lows to 23°C. Finish up your sightseeing early on the 23rd (Tue) so you can catch the train back home.